Flavorful, juicy and hearty, this chicken recipe will be one that will become a regular in your recipe rotation. I spiced up the poultry with some ginger, garlic and white miso and then snuck in an extra serving of veggies using riced cauliflower. The end result is a delicious dish that will make your taste buds happy! Preheat oven to 375°. Heat a Dutch oven over medium-high. Add riced cauliflower to dry pan. Cook for 8 minutes or until deeply browned. Remove from pan. Add oil to pan and swirl. Sprinkle chicken with ½ teaspoon salt and ½ teaspoon pepper. Add chicken to pan and cook for about 5 minutes on each side, or until cooked through. Remove from pan. Add light-green onion parts, ginger and garlic to pan, and cook for 2 minutes, stirring frequently. Add remaining ¼ teaspoon salt, remaining ¼ teaspoon pepper, stock, rice vinegar, miso and loosen browned bits. Add riced cauliflower and chicken to pan. Cover and bake for about 45 minutes or until chicken is cooked through. 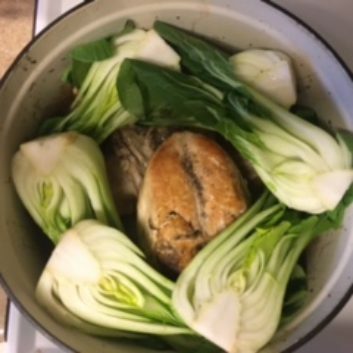 Arrange bok choy halves around chicken, cover and bake for 15 more minutes. Uncover and sprinkle dark-green onion parts and cilantro over chicken. Enjoy!